Trip dates: Customized, generally best between May and September. a Giant Panda up close! This spring-summer trip to Sichuan, China is designed for Giant Panda lovers as well as those who simply enjoy seeing the Panda in captivity and a chance (though slim) of seeing it in the wild. 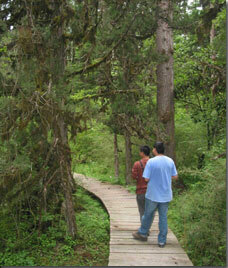 It visits the protected home of the Giant Panda, Wanglang Nature Reserve, amidst spectacular mountain landscape. On a longer trip, you can journey north to Sichuan's scenic highlands inhabited by Tibetan nomads, visiting their homes and monasteries in a land seldom visited by Western travelers. 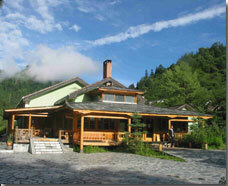 Designed by KarmaQuest Ecotourism Specialist Wendy Lama, this trip builds upon her work in ecotourism development and wildlife conservation with the World Wildlife Fund (WWF) in Wanglang Nature Reserve. Guided by an English speaking Chinese guide, you'll have a chance to talk with Wanglang Reserve leaders whose programs protect the Panda in situ, and through their in-depth knowledge of the Panda and Reserve, have a chance -- though small -- of seeing a Panda or more likely its sign in the wild. 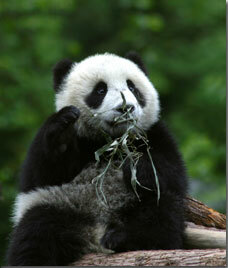 The journey begins in Chengdu, with a visit to the Panda Breeding Center and to Chengdu’s historical neighborhoods. Next stop: Pingwu, with its stunning 500-year- old Buddhist monastery and spicy Sichuan cooking. Three days (or more if you prefer) are allotted to explore the primary forests and alpine meadows of Wanglang Reserve, searching for sign of the Panda and learning about its daily habits and life cycles from Reserve staff. Accommodations are quite comfortable (see photo left). You'll also spend time with the Baima villagers, known for their colorful dress, dance and song, giving insight into rural people’s struggles in a fast changing economy. On longer trips you will venture north to visit other reserves noted for their spectacular geologic formations and vividly colored lakes. Driving excursions and walks on the Tibetan plateau– enhanced with visits with families and monasteries – introduce a land and culture little visited by Western travelers. The trip ends with a return to Chengdu by air. An optional three-day extension is available to Wolong Nature Reserve, a premier Giant Panda Captive Breeding Center, and with opportunities to see and photograph the Panda up close. KarmaQuest will assist those wishing to travel before or after the Sichuan trip on a customized trip elsewhere in China, such as to Yunnan, Tibet, or Beijing. Itinerary Please contact KarmaQuest for more information.